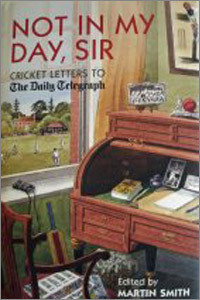 This fascinating book traces the best of the cricketing letters from The Daily Telegraph letters page since its inception in 1928 and shows what, in the cricketing world, gave rise to people’s gripes and forced them into putting pen to paper and sending in their thoughts. Martin Smith, a former Assistant Sports Editor and a sports writer for The Daily Telegraph, is in the ideal position to compile the best cricketing letters to be received and put them into this entertaining book. Chronologically presented since 1928, this also shows historically how things have changed through the years: people in the earlier days signing off with their initials and surnames rather than Christian names and surnames are more apparent – although the odd pseudonym crops up occasionally - and it is interesting to note the areas of concern which caused the writers to write to The Daily Telegraph. Amongst the letters, E.W Swanton and Percy G.H Fender appear to have been regular contributors and, throughout these pages, other cricketers have felt the need to justify themselves through The Daily Telegraph’s pages. Martin Smith feels sad that today’s writers send emails and that the days of letter writing are very much on the wane. All the letters within this book have names and the area in which the writer lived and not finished “ by email”. On the historical front again, Bodyline features prominently, people suggest re-naming the game for its different formats with suggestions such as “crickette” and “blockit” and the general appearance of cricketers is often mentioned. The preface mentions a D.M Hamsworth aged 29 who feels that writers should put their age to any letter written as he felt that the majority belonged to the over 50 bracket who didn’t realise that modern day sport is about winning. It started up a robust verbal skirmish between writers aged between 48 and 70, all with their own differing opinions and I am sure that there were many others who entered into the debate. In this book we have the long letters, the short and pithy and all are well written. Showing how things change down the years, what mattered to the correspondents at the time and that not only cricket lovers but the good and great of the game took the time to write to The Daily Telegraph, Not In My Day, Sir is a book with a very broad appeal.